NEXT COURSE DATES: 2-4 October 2019 – please contact us for details. From 2019 onwards, this course will be run with the support of Brunel University London. A practical three-day qualification from The At Work Partnership, which is designed to train occupational health and other professionals, in the theory and practice of case management skills – in order to improve absence management, job retention and return-to-work outcomes. This course will equip you with the theory and practice to improve your case management skills – helping your organisation to reduce the burden of long-term absence by improving return-to-work and job retention outcomes. Students who successfully complete the assignment will be awarded the Certificate in OH Case Management. 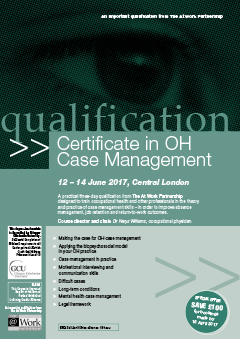 The course is designed for occupational physicians, occupational health nurses, case managers and people working in OH-related disciplines whose roles encompass case management.